We're really enjoying posting in our recipe section and ran a Twitter poll to see which recipe you'd like to see next, you said our beer dip recipe perfect for pairing with our pork pies, so we listened and here it is! A really easy dip to create, there's no cooking time and you can store it in an air tight container if you make too much and want to enjoy the next day too! 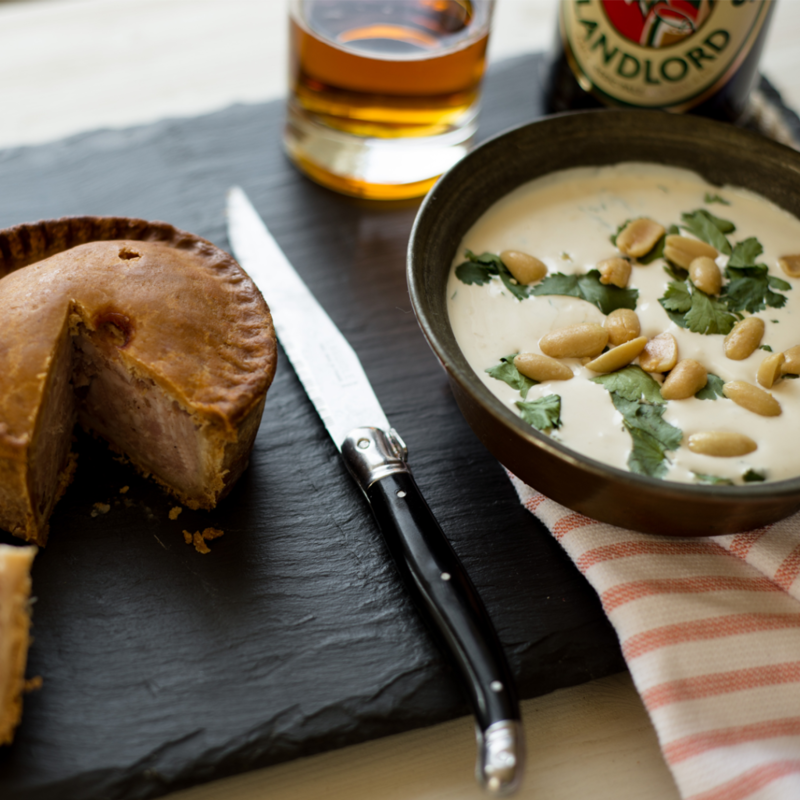 We love the beer flavour with our pork pies so this recipe is perfect! Stir and fold in the cheese, be gentle with this as you want the mixture to remain thick and cheesy and not break the strands of cheese into more of a mush which will happen if you stir too aggressively! It’s such a simple recipe to create but one great for parties or when friends are round as either a dip for a starter or for when you’re watching a game or film. We garnished our beer dip with some peanuts and parsley just for some colour, texture and flavour. As you can tell from the peanuts on top of the dip, the dip itself is quite thick. The beer, cream cheese and cheese working together to thicken the recipe. We’d eat this with a large pork pie. Slicing the pie into wedges to ensure it’s perfect for sharing and allows the taste of the beer to really shine. The dip is a wonderful pairing for tender pork and mouth watering pastry. If you want to serve smaller pies, go with our mini pork pies or medium so they can be enjoyed individually by guests and still held in the hand. Perfect for when guests are enjoying some food with their drinks at parties. Enjoyed this recipe? Make sure to have a look at all our recent recipes!